Add some color to your meal with this delicious, bright, and flavorful salad! Remove kale from stems. Rinse and dry kale leaves, cabbage, and apples before cutting. 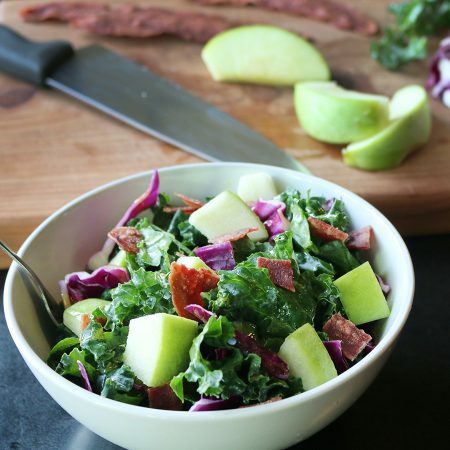 Put chopped kale, cabbage and apples in a large mixing bowl. Whisk together olive oil, apple cider vinegar, honey, and mustard. Pour over salad and toss to coat all ingredients. Cook turkey bacon and roughly chop. Sprinkle bacon over top of the salad and serve. Prep ahead! Rinse, dry, and chop cabbage and kale up to 3-5 days ahead. Store in fridge. Store any cleaned leftover kale and cabbage in the freezer to use in soups, stews or stir-frys.